Home >All Reviews>See Sri Lanka Tours>See Sri Lanka Tours – The best tour with Chaminda! See Sri Lanka Tours – The best tour with Chaminda! Choose Chaminda for the best Sri Lanka Tour! We spent 6 days with Chaminda from 22nd January 2019. From the very first contact, Chaminda was so helpful. He quickly answered all our questions during the planning of our trip, giving us honest advice. Immediately on meeting him when he picked us up from our Colombo hotel in his immaculately clean and well air conditioned minivan, we knew we would get along just fine! His English is excellent and we chatted the whole time! He is proud of his country and his knowledge is broad, explaining the background to all the places we visited. He made sure we saw as much as possible during the 6 days we had together, working out the best times of day to visit each area in order that it wouldn’t be too busy. He also took us to the less commercial attractions, suggesting more ‘local’ alternatives which we would never have known about. He even stopped to buy us local fruits from the street vendors so that we could try things we hadn’t had before! He joined us for lunch a few times, explaining the dishes on offer and helping us choose our food – all of which was delicious! He never tried to organise anything we didn’t want to do or to make us visit places we were not interested in. Basically, he listened to us. 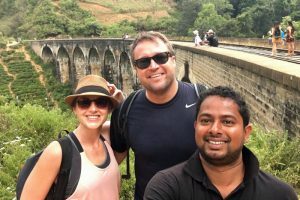 We had a lot of fun on the trip, he laughed with us a lot and also spoke very honestly when we asked him more sensitive questions about religion in Sri Lanka, the war, how he felt about us Brits after the history… He was so approachable we felt we could ask him anything! We cannot recommend Chami highly enough and can only say that he made our trip so memorable. We have no doubt he will do the same for you!